The mission of Project ALLIES (Alliance Linking Leaders In Education and Services) is to provide a network of informed students, faculty and staff who are willing to be visibly supportive of the lesbian, gay, bisexual, transgender, and queer community at the University of Louisiana at Lafayette. 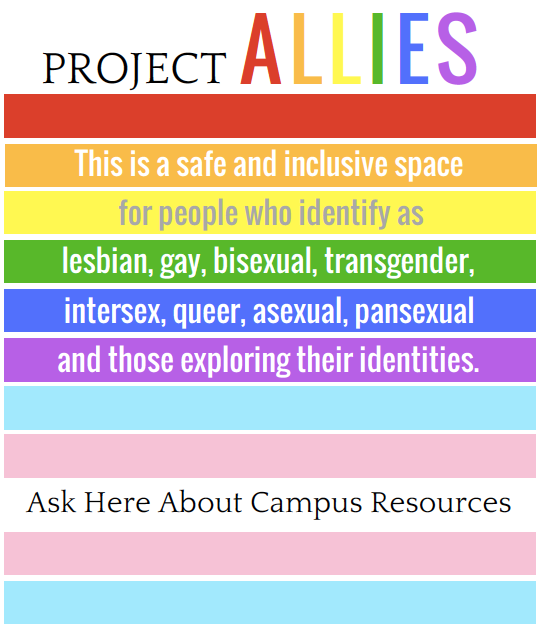 ALLIES will work to foster a campus climate in which all members of the University community, regardless of sexual orientation or gender identity, may feel safe, supported, respected, and affirmed. If you are interested in learning more about the Project ALLIES – LGBTQ+ 101 Workshop, please contact us at diversity@louisiana.edu. Helping students connect to resources is one of the best things you can do as an ally. UL Lafayette and the Acadiana community have several resources to offer. Gender-neutral housing options are available for all students upon request, designated as safe living spaces for gender variant and LGBTIQA students. Contact Leah Lae in the Office of University Housing at 337-482-9073. Student health care and mental health care that is respectful, non-judgmental, and comprehensive; this includes prescription refills, STI testing and treatment, and counseling referrals. Contact the Saucier Wellness Center at 337-482-1293. Family Restrooms are located on the first floor of the Student Union. To learn more about the many ways you can get involved with our student organizations, visit the Office for Student Engagement and Leadership on the first floor of the Student Union. Giving Love, Acceptance, Safety, and Support (GLASS) is an LGBTQIA and straight ally organization on campus whose goal is to connect the bridges of communication between different sexual identities, communities, and genders. Gamma Rho Lambda has been referred to as the first national lesbian sorority; however, they are inclusive of all members, regardless of gender identity or expression. Delta Lambda Phi is a Greek organization dedicated to enhancing the quality of life among students irrespective of sexual orientation or gender expression by providing dignified and purposeful social, service, and recreational activities. Students for the Advancement of Women (SAW) promotes women’s interests and gender equity on campus and in the community through advocacy, education, and volunteer work. University Program Council (UPC) Culture Committee plans campus-wide programs celebrating a variety of diverse cultures and heritages. To learn more, visit the UPC Office in the Student Union. Campus-wide educational programming is available, through the Project ALLIES – LGBTQ+ 101 Workshop offered by the Office for Campus Diversity. For more information, email diversity@louisiana.edu. A minor in Gender and Sexuality Studies is available through the College of Liberal Arts. For more information, visit Griffin Hall. Library resources are available in Edith Garland Dupre Library. Acadiana CARES is a community organization dedicated to providing education and services for prevention and care for those living with and affected by HIV/AIDS. To learn more, visit http://www.acadianacares.org/.